By using the context sensitive keyword override and final you can explicit manage the overriding of virtual functions. In particular, the keyword override solves a lot of issues with difficult to finding bugs in object hierarchies: Methods that should override methods of base classes. The result is a syntactically but not semantically correct program. 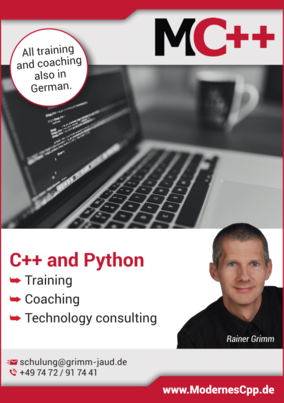 The program performs the wrong stuff in the right way. Enumerations are a convenient way to define integer constants with names. This integer constants are called enumerators. Sadly, classical enums have a few drawbacks. 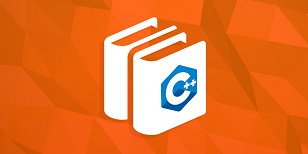 C++11 has user-defined literals for characters, C strings, integers and floating point numbers. For integers and floating point numbers they are available in raw and cooked form. Thanks to C++14 we have built-in literals for binary numbers, C++ strings, complex numbers, and time units. 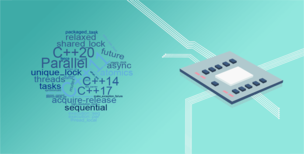 User-defined literals are a unique feature in all mainstream programming languages. They empower you to combine values with units. 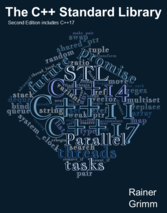 Just published: The C++ Standard Library: What every professional C++ programmer should know about the C++ standard library. 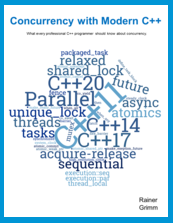 The C++ Standard Library: All you have to know as professional programmer about the C++ library. The type-traits library empowers you to compare and modify types. All is done at compile time therefore there is no performance penalty. Template Metaprogramming is programming at compile time. But what has template metaprogramming in common with the type-traits library? A lot! The type-traits library is pure template metaprogramming, tamed in a library. With this post my presentation of the type-traits library becomes more structured. In the post Statically checked I wrote that the functions of the type-traits library are an ideal fit for static_assert. The reason is that static_assert requires a constant expression. The functions of the type-traits library provides a lot of checks which can be performed at compile time. With this posts I will prove my statement.